In a slight deviation from my blog's regularly scheduled theme of things I cook and eat, I wanted to show you one of my dog's favorite treats: ~R's gloves. Last summer when ~R met the Digger for the first time, the dog demonstrated his enthusiasm for his new owner by chewing off the thumb of ~R's Filson gloves. After a few months of debating whether to send them back, ~R decided it was worth a shot and Filson graciously replaced them with a brand new pair, which he received last Wednesday. The next Friday (i.e. two days later), we went out for dinner. When we returned home, we found that Digger had chewed the thumb off the brand new glove. Apparently the thumb is the tastiest part of a wool glove. Lucky for ~R, before I started law school, I used to knit and I miraculously have retained knowledge of this handy skill. i pulled out the bits of broken yarn, unraveled a few rows and using some leftover sock yarn, picked up stitches and knitted ~R a new thumb. After seven months spent reading textbooks, sitting in class and generally making no real contributions to the world, it felt great to actually produce something, even though it is just 1/2 a thumb. And I am quite proud of my knitting skills after such a long hiatus. So proud that I've included it in my food blog. I'm in the final week of spring break and it's been just delightful. i wish i had spring break once a month. there's nothing quite like two weeks without a schedule. i'm trying to get my outlines up-to-date for class, but even that is fairly relaxing . . . just hanging out at home, sitting at the computer with the dog by my side, me drinking massive quantities of licorice mint tea. at any rate, last week we were blessed with beautiful early spring weather. and what better way to celebrate than by sitting in the backyard, sipping a cold beverage and tossing a ball for the dog. 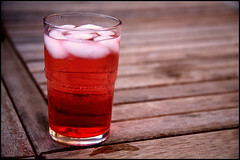 campari is one of those liquors that inspires either love or hate -- I've never known someone to feel so-so about it. i'm definitely on the love end of the spectrum. on this particular sunny day, ~r made me a drink halfway between a campari & soda and a negroni (campari, gin, vermouth) because we didn't have vermouth at the time (problem now corrected) and because i like a little fizz in my drink. quite delightful! i look forward to many more summer days of the same. i'm on spring break this week and next and so i've been cooking, which i haven't really done since school started. it's wonderful! right now i'm waiting for butter to soften so i can make dessert to bring to my parents' house tonight. 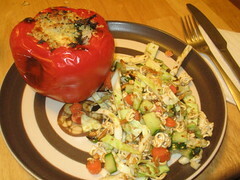 a few nights ago, i made this quinoa-stuffed red pepper dish and a cabbage salad. the quinoa mix had diced leftover pork chops, fresh mozzarella, kale, onions, garlic and spices. it was pretty awesome. the cabbage salad is an old standby. rick immediately recognized it as his aunt's ramen salad. this is what happens when two midwesterners get together. my mom used to (and probably still does) make this salad all the time -- they probably have the same newspaper recipe. anyways, it's just cabbage, cukes, carrots, scallions, toasted almonds, toasted sesame seeds and crushed ramen noodles. 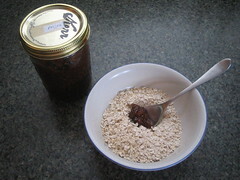 the ramen spice packet is mixed with rice vinegar, sesame oil, a little sugar and a little salt to make the dressing. it's really the easiest thing ever. This is a dish I didn't make represented in a photograph I didn't take. I'm in the midst of writing this frustratingly large paper. 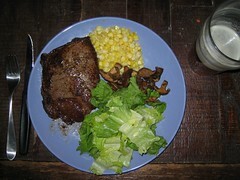 Luckily, ~r cooks for me (all the time -- not just when I'm writing major papers). Last night, he really shined. He roasted a whole chicken, roasted brussel sprouts and tossed in toasted pine nuts (actually, I did the tossing -- it was my contribution) and made a mushroom rice pilaf. It was The Perfect Dinner. My favorite part was the brussel sprouts. I don't understand how people cannot love brussel sprouts. They're such tasty little bites of goodness. They're easy to ruin, I guess, and certainly a soggy tasteless yet slightly bitter brussel sprout is pretty gross. Luckily, ~r has mastered the brussel sprout. He sautees them on the stovetop and then moves them into the oven to finish. Sometimes, we'll toss them with parmesan in addition to the pine nuts. 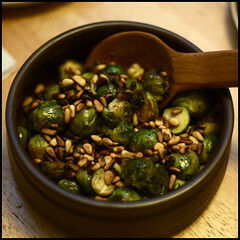 Last night, cheese wasn't needed -- the brussel sprouts were creamy, but not soggy. They were a bit carmelized from baking in the oven, too. Anyways, I'm still writing my massive paper, so this is all I'll write for now. But, suffice to say, dinner last night made me very happy. we have leftovers from last night's dinner: a delicious, thick, rich tomato sauce that R made. 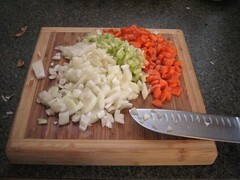 what could be better than using it to make a delicious (i hope) minestrone-style soup? i've got everything prepped and ready to go -- i'm just waiting for R's arrival with white beans and those little tubes of pasta allegedly called canneroni (what do i know? i'm jewish! the only pasta i know by name is noodle kugel!). i am a big fan of soup especially in winter. it's super easy and fills the house with warmth and a pleasant aroma. and i did i mention it's easy? because if i am one thing, i am a lazy cook. granted, i'll be inspired to spend all day in the kitchen for a special occassion (this amazingness is in my future -- just looking at it makes me want to swoon.) but when i'm just making a weekday dinner, i can hardly be bothered to cut an onion -- and it's gotten even worse now that i'm in school. 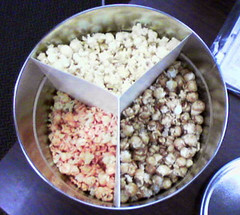 if it wasn't for R and his love of cooking, i'd certainly be eating popcorn, tuna salad on crackers (or soup) for every meal. if only he could do my homework for me too. alas. but i'm excited about tonight. i hope it's good! report to follow. REPORT: The soup was, in fact, delicious. Sadly, I have no photographic evidence (oops! ), but here it is: minestrone with meatballs, white beans and casarecci (http://www.recipetips.com/glossary-term/t--35357/casarecci-pasta.asp). The homemade broth and tomato sauce gave the soup a rich, full flavor. We had a salad with lemon vinaigrette on the side. No parm for the soup, but it was so rich, that I think it was just fine without. A perfect winter meal! And not a bad performance, given that I haven't cooked a full meal in months. I'm glad I still got it in me. R and i spent this last weekend in a cabin up in northeastern wisconsin. the cabin, belonging to a friend's mom, has no electricity and no running water. it's got propane tanks that they've hooked up to a stove and to some lights in main room (i say "main room" like it's one of many but there's really the main room, the bedroom and a loft space). there's a driveway but it gets snowed in during the winter, so we had to snowshoe in about 1/2 mile. the place is tiny -- about 400 square feet -- and sits on a lake in the middle of the woods, with no one else to be seen. after six months in chicago, it was a welcome break from urban jungle. on day one, R and the dog frolicked about while I curled up on the couch with a cup of tea and my con law book. on day two, we went for a hike through the woods. for breakfast on day two, we had pancakes with sausage. R made the meat, i made the pancakes. in keeping with family tradition, i used the last of the batter to make initials. i loved when my mom did that for us when i was a kid. 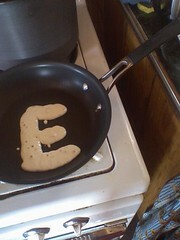 an 'E' is particularly exciting because it can go from an E to an F to an L to an I. It was cool when I was seven and, somehow, it's still a good time. 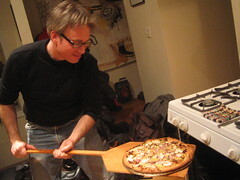 last weekend, a friend (pictured) hosted a pizza party: he supplied dough, cheese and sauce; guests supplied toppings. it was a clever idea and you should all host similar parties. we had a countertop spread with various toppings and the host pushed out pizzas all night long. it didn't hurt that the crust was awesome and that the host had a lovely pizza paddle that gave the whole thing a certain air of authenticity. it also didn't hurt that the wine was flowing. this guy -- he knows how to host a dinner party, that's for sure. in fact, his are some of the best i've attended. the food, the wine, the company and the Tom Waits on the radio. The previous party I attended featured wild boar ragout. hello! and more wine. today's my birthday and when i arrived at school, my friends were waiting for me with a box of delicious swedish pastries (and a cup of coffee). 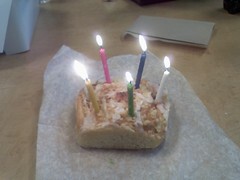 i have great friends! the pastry pictured is some sort of coconut cinnamon roll thingy. 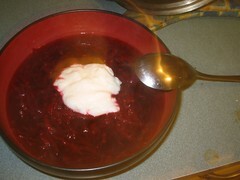 it was deee-licious and much more exciting than my usual breakfast of yogurt. and i have two more pastries waiting for me in a little pastry box in my locker. score! it was, unless i'm forgetting, my first pastry from the Swedish Bakery, which is up in Andersonville. i've gone by that place a hundred times but i've either resisted or (more likely) been on my way to somewhere else to get food. i went in there once but was frankly totally overwhelmed by my options (i'm a pisces -- i'm very indecisive). it was much nicer having someone make my selection(s) for me. 2. i'm a student and, as such, have plenty of time to do stuff like spend five minutes writing a blog post. I'm going, perhaps foolishly, with the latter. 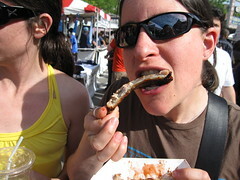 And so i pledge ON THIS DAY FEBRUARY 23, 2009, THE LAST DAY OF MY 31st YEAR to revive Deepfry. Yes, most of its readers have undoubtedly fled, leaving behind only those who are too lazy to update their blogreaders. But that's ok, because I think I need the creative outlet. If I don't do this, I'll end up only with the ability to write in legalese. So, Deepfry, welcome back to Deepfry! Thanks Deepfry! 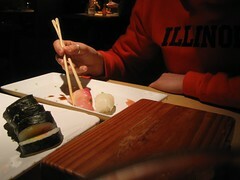 Pictured, btw, is a recent snapshot of a portion of Valentine's Day dinner with R at awesome San Soo Gab San. 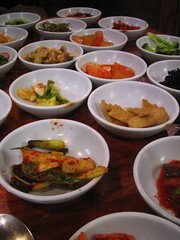 Each time I get Korean BBQ, I find another side dish that I really like. It's literally a bite by bite expansion of my palate. how can something this gross be oh-so-good? one of my coworkers actually observe, reaching into the bucket for more, "this smells like my dog's vomit." i didn't know they still made these things. i remember my parents getting one at some point in the mid-80s and thinking that it was just about the coolest thing since sliced bread. ...actually, since i was about ten at the time, i probably thought it was the coolest thing since poprocks or jelly shoes. for just this one little week, r and i are eating only locally grown/raised food. our "local" means the state of oregon. pictured is one of our dinners. we've also had peppers stuffed with pork and feta, roasted chicken with mashed potatoes, some really awesome salads, lots of cheese sandwiches (Hideaway Bakery use "as many local ingredients" as they can find, so we're counting them so we can eat bread), lots of oregon beer, a peach rasberry cake and a crawfish boil with crawdads we caught in the siuslaw. we even got a pre-view 1/2 pound of prosciutto from my favorite gourmet grocery so r could have cured meats on his birthday. we each chose one cheat and get to share them; i picked coffee and r picked fizzy water...its funny what foods/beverages people can't live without. and we decided salt was allowed. 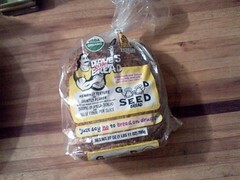 i'm surprised at how hard it is to find local foods in the grocery stores around town. we live in the willamette valley, after all. we're surrounded by organic farms! but we've found only two grocery stores that offer any substantial amounts of local produce: Kiva and Capella's. other grocery stores offer bits and pieces of local foods (or at least foods that are labeled as local) so if we don't make it to Kiva or Capella's, we have to go 'round to several grocery stores. We can also get local foods at the specialty stores: Long's, Newman's, etc. Luckily, i stocked up on produce at the Saturday Farmers' Market and we were able to stop by the Thursday Farmers' Market to replenish. on the other hand, putting so much planning into meals leads to excellent results. we've been eating wonderful, well-balanced, multi-course meals. this is partly because we probably chose the best month of the year to engage in this little eat-local exercise but also largely because we're just thinking so much about what we eat. not bad at all.